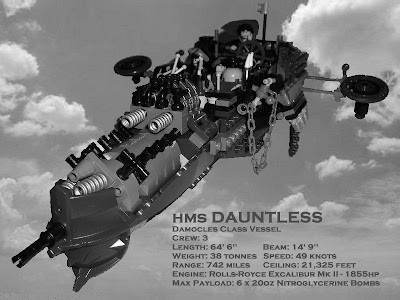 The Royal Aeronautic Corps vessel HMS Dauntless was launched from the Belfast airyards of Harland & Wolfe in August 1896. Designed for the purpose of aerial bombardment, the Damocles Class was originally fitted to carry large conventional munitions. However, the weight of this payload was to limit both range and operating ceiling - relegating the Damocles vessels to a supporting role. With the development of new Liquid Nitroglycerine munitions, the Damocles Class ships were refitted to carry these lighter and more powerful explosive devices. This change has seen the Damocles Class vessels become a key component in the Corps' projection of Imperial power in the skies of Northern Europe. The move to the more volatile liquid explosive has not been without cost however. June 1901 saw the tragic loss of 3 aircrew and 14 ground support staff in an explosion at the Farnborough airdock during the loading of the Dauntless' sister vessel, HMS Defiant. A collection of further photographic images of HMS Dauntless, many of them reproduced in full colour, may be viewed here.